While the rest of the nation is in financial straits due to the sequester cuts, the DEA soldiers on. 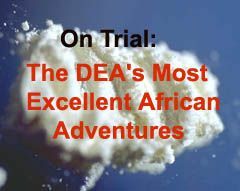 It just finished spending months on yet another Most Excellent African Adventure, which ended with traipsing 5 Africans, who had never set foot on U.S. soil or planned to commit any crime here before the DEA suggested one to them, to New York where they face potential life sentences. Once again, the case involves FBI informants pretending to be Colombian providers of cocaine offering to fly drugs from South America to West Africa. Had the drugs been real, they would been shuttled from Africa to Europe. For jurisdictional purposes, the informants made sure to tell the Africans that a minor portion of the drugs would go to the U.S. and Canada. To make the case fit the DEA’s “narco-terrorism” meme, the informants also asked the Africans to supply missiles and weapons, telling them they wanted to use them in Colombia to shoot down U.S. aircraft destroying their cocaine fields. Bump and Update: The jury convicted two defendants, including Russian pilot Konstantin Yaroshenko, and acquitted two defendants. Giants owner John Mara was one of the jurors. 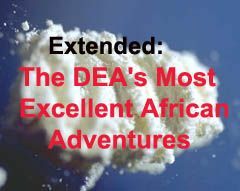 How Much Did the DEA Spend on its Africa Vacation? The DEA informants pretend to be from FARC, willing to ship cocaine from South America to Africa where three Africans with claimed al- Qaida ties promise to transport it across the African desert into Spain. Here's the Complaint (pdf). It doesn't sound like they got any cocaine or there ever was any cocaine, and the deal almost fell apart a few days before the bust.